What is the link between the CD above and the monitor speaker below? Well, the obvious one is that the Bowers & Wilkins 803 speaker in the photo is one of a pair used for most of my listening. But there is a more interesting link and it involves a subject close to the heart of this blog, sound quality. On the CD, which is performed a cappella, the Lebanese singer and musicologist Ghada Shbeir sings ancient ancient Maronite texts that she has set to traditional Syriac melodies. After just a few minutes auditioning the disc two things become very clear. First, this is music making of the highest order, and secondly, it is captured in sound that is astonishingly clear and life-like. The link between the two photos is an acoustic phenomenon that is responsible for the exceptional sound of both the CD and the speakers. And if that is all somewhat opaque let me explain. A previous post about the Castel del Monte in Italy discussed how reflections generated by parallel surfaces are the enemy of good sound. Which means, in simple terms, the fewer parallel surfaces the better the sound. Bowers & Wilkins have exploited this phenomenon in their top range of speakers by making the cabinet semi-circular in section and by enclosing the tweeter in a teardrop shaped enclosure, as can be seen in the photo of my speaker. 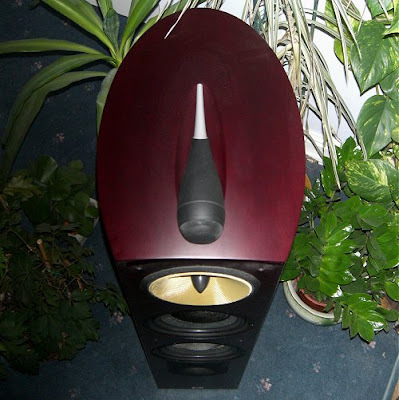 This design approach adds complexity, weight and price but results in superlative sound. A lack of parallel surfaces also explain the superlative sound on the Syriaque Chant CD. It was recorded in the 17th century monastery Our Lady of Tamish in Lebanon. As the photo below shows, the semi-circular barrel vault roof of the recording venue eliminates parallel surfaces and replicates the sonic properties of the computer designed Bowers & Wilkins speaker cabinet. Ghada Shbeir's CD of Syriaque Chant comes from French independent label Jade who know a thing or two about good sound. 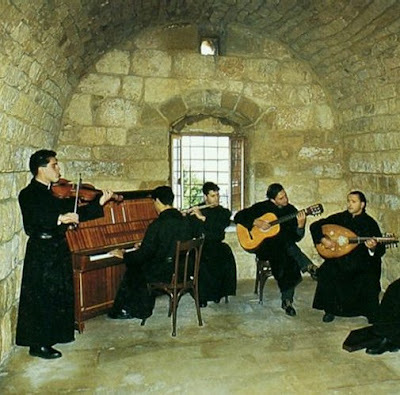 Their recent CD of Gregorian Chant from the monks of L'Abbaye Sainte-Madeleine at Le Barroux was praised here recently for both its musical and technical qualities. Interestingly the sound engineering credit for the Lebanese recording goes to Fr. Marwan Issa. I can find out no more, but could he be a monk of the Lebanese Maronite Order that the monastery is home to? Syriac Christianity, which is a branch of the Eastern Christian Church, uses the ancient Syriac language, this is a dialect related to the Aramaic used at the time of Christ. Lebanon and Syria are on the cultural cusp between East and West and this is reflected in the chants on the disc which are truly multicultural art rather than the currently fashionable multi-cultural artifice. This outstanding CD was yet another discovery from the monastic shop at Le Barroux during my recent visit. Previous discoveries have included glorious discs of sacred music from Armenia and Mount Athos, and the wonderful recital of Jewish music by pianist Jean-Rodolphe Kars. Quite sensibly Jade decided that a full length CD of solo Syriaque Chant could be too much of a good thing so it comes as a thirty-four minute mid-priced disc which can be downloaded from amazon.co.uk for £6.99. On the eve of a new year this post has taken us down a particularly fascinating overgrown path. Ancient texts and melodies recorded in a Middle Eastern monastery using the latest digital technology are played back through state of the art speakers sharing acoustic properties with the centuries old recording venue. Which simply confirms there is no such thing as old and new technology or old and new music. All we have are the sounds of the moment, because music exists only in constant flow and flux. * Now read about an Arabian passion according to J.S. Bach, and listen to it in a podcast here. Happy new year to you as well, bob!